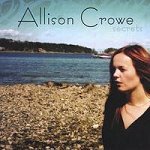 Well, I’ve been an admirer and supporter of Allison Crowe since I reviewed her first EP, “6 Songs” in October of 2002. I was stunned then, as I am now. This incredible chill-inducing voice coming out of a young person is such a rare treat in the age of Britneys, Hilarys and so on. This girl’s the real deal. This release showcases Crowe’s beautiful strong, gutsy voice, as well as her piano playing and songwriting that seem way past her young years. She has actually matured on this CD in comparison to her previous releases. Though she doesn’t really sound like either of these two, fans of Sarah McLachlan and Vienna Teng should take notice. Allison Crowe is an amazing talent and the music world would be doing itself a huge favor if it paid her the attention she deserves. Another (more “rock”) album, “Alive and Breathing”, is also slated for release late 2004. One of these CDs ought to bring Allison Crowe to the forefront of today’s music. Get her CDs now, and you can say you knew her “when”. Stand out songs: Well, I adore them all, but my favorites are “Raining in Baltimore”, “Montreal” and title track “Secrets”.